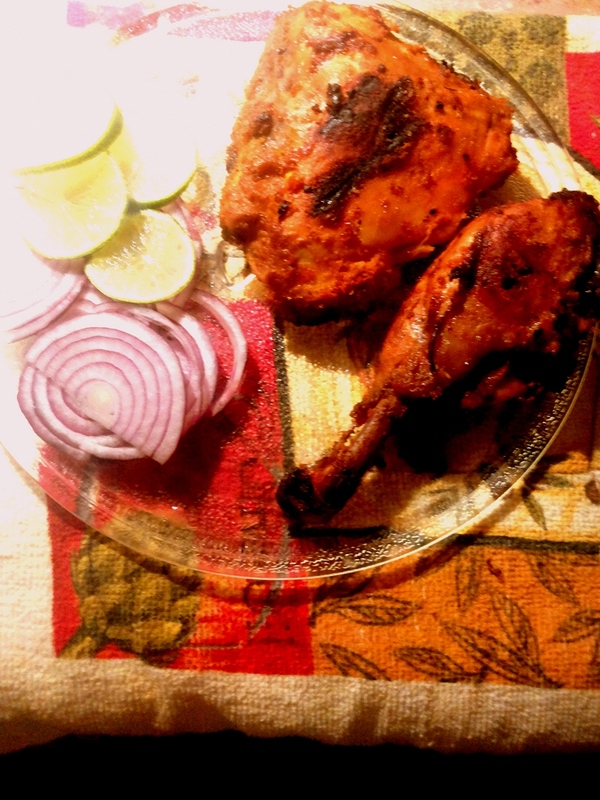 Tandoori chicken, is perhaps one of the most iconic recipes from India. It has attained great culinary heights and rubbed shoulders withe fois gras and caviar by featuring in royal banquets in Britain and else where in Europe. It was President Clinton’s favourite food, need we say more? Traditionally, cooked in a cylindrical clay oven, as the name suggests, tandoor. The idea of cooking the meat in the tandoor is that the extreme heat of the tandoor cooks the chicken till it is crispy on the outside with a hint of smokey taste on the inside. Prior to the grilling, the chicken is marinated for hours, upto 24 if you want the meat succulent with a combination of spices and yogurt. To get get that firery red colour , traditionally large amounts of turmeric and kashmiri red chilly powder i.e. cayanne pepper was used but these days most commercial places have replaced them with red/ orange food colour. 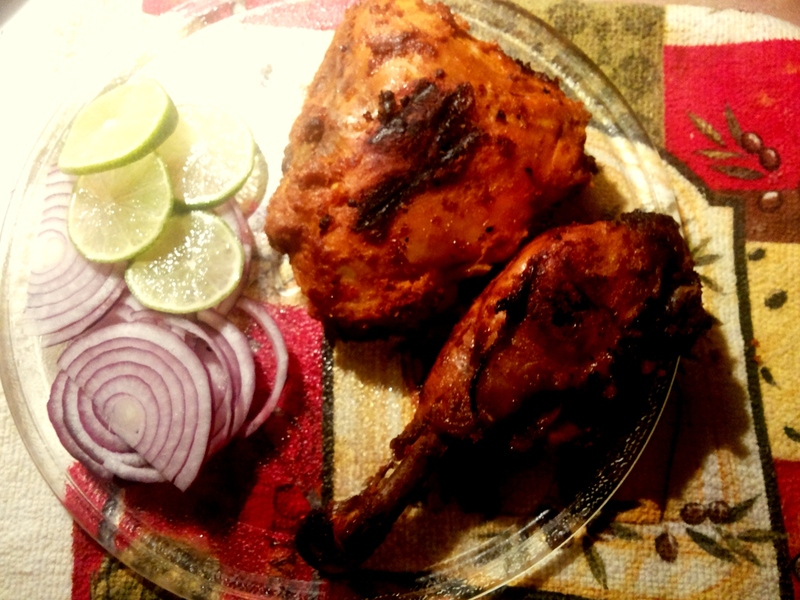 Being a Delhi girl I grew up eating tandoori chicken, tried countless restaurants and eateries till I could find that one place which made the perfect Tandoori Chicken. 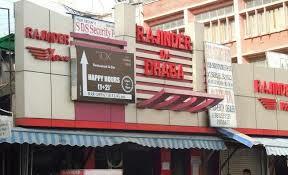 As luck would have it, i found not one but two places that according to my pallet made the best possible Tandoori Chicken in Delhi ; Diviya’s Rimpy in Malaviya Nagar and off course the very famous Rajinder da Dhaba. I am sure there are people who would beg to differ but this is my list :). 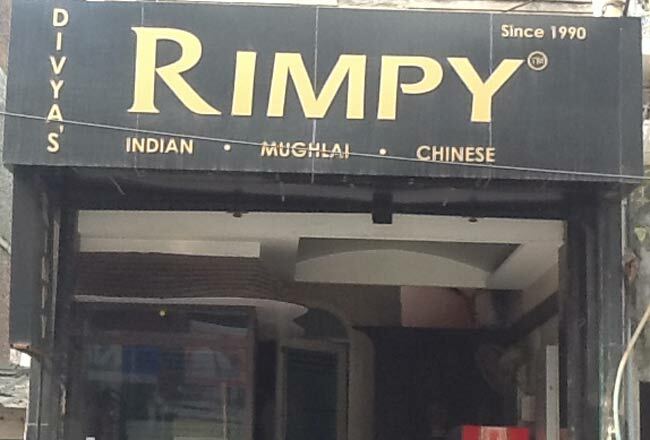 Here in the US, the restaurants make an honest attempt but the taste is no where that of back home. It just does not happen. I like my tandoori chicken home-cooked and normally use my own spice rub for the marinade, having said that, there is no reason you cannot use the packaged tandoori masala, just bear in mind, they contain high amount of sodium so you’ll need to adjust the salt in this recipe. I never use colour, you don’t need to, if cooked to the right temperature you should get that light orangish tint, if not you can always add smoked paprika. Wash and Clean the chicken legs and thighs and make slits on them. Next in a bowl combine yogurt, turmeric powder, chilli powder, coriander powder, cumin powder, garam masala, ginger garlic paste, salt and lime juice. Apply this marinade to the prepared chicken legs till they are fully covered in the marinade. Refrigerate the marinaded meat for at least 6 hours- 8 hours. In case you do not have the broil facility in your oven, use a grill pan to sear the chicken for about 3-4 min on either side. Place it back in the oven and keep it warm and covered setting the oven temp to about 200 deg F.
Make sure you use Chicken on the bones.